At National Institute of Technology (formerly Regional Engineering College) Warangal since 1996. As Scientific Officer at Bhabha Atomic Research Centre, Bombay (Mumbai) During 1993-1996. As Executive (Technical Services) at AP Rayons Ltd., Kamalapuram, Warangal during 1992-1993. Ph.D. in 2006 from National Institute of Technology, Warangal. M.Tech (Chemical Engineering) in 1992 from Indian Institute of Technology, Kanpur. B.Tech (Chemical Engineering) in 1990 from Regional Engineering College, Warangal (Presently National Institute of Technology Warangal). (i) At B.Tech: Fluid & Particle Mechanics, Heat Transfer, Mass Transfer, Process Engineering Economics, Chemical Engineering Thermodynamics, Biochemical Engineering, Mechanical Operations, Process Equipment Design and Drawing. (ii) At M.Tech: Membrane Separation Techniques, Advanced Heat Transfer, Optimization of Chemical Processes, Project Evaluation, Optimization Techniques. Thermophysical properties of silica aerogel products for thermal insulation application. (22) CFD Simulation of Heat Transfer performance in Disruptive Microchannel Using Hybrid Nanofluid, Gaurav Gilhotra (2018). (21) CFD Simulation of Dimensional Effect on Heat Transfer in microchannel using nanofluid, Haritha Madhava Reddy (2016). (20) Dynamic Simulation of Algae Production in a Photobioreactor using CFD, Neelima K (2016). (19) CFD Simulation of Heat transfer in Microchannel with Dimple and Protrusion using Nanofluid, Rahul Kunnath (2015). (18) CFD Simulation of heat transfer using nanofluids in double pipe helical heat exchanger, Meenakshi (2014). (17) CFD studies on pressure drop for low Reynolds number Newtonian and Non-Newtonian flows across orifice in Microchannels, Bhuvaneswari G (2014). (16) CFD Simulation of Dynamic Behaviour of Bubble Column Bioreactor Degrading Phenol. Kuldip Rangari 2013. (15) Experimental and Modeling Studies on the effect of catalyst/additive and olefin addition on isobutylene yield in FCCU. Arunachalam Kartik Ramaswamy, 2012. (14) Experimental Study on Production of Dimethyl Ether from Syngas, Methanol and Steady State Modeling of An Isothermal Fixed Bed Reactor for Methanol dehydration to Dimethyl ether, Abdul Quiyoom, 2011. (13) An Approach for Efficient Energy Utilisation in Platforming Technology, K Himabindu, 2011. (12) Design and Controllability of Alternative Sequences for the Separation of Ternary mixture N. Rajasekhar 2010. (11) Microfluidics of Nanodrug Delivery at Different flow conditions P. Sadasiva Rao 2010. (10) Microfluidics of Nanodrug Delivery at Different Angles of Drug Injection B. Narender Reddy 2009. (9) Two Dimensional Simulation Of Flow Past A Square Cylinder In A Channel Y.Sravani Gowri Laxmi 2008. (8) CFD Simulation Of Wall Effects In Flow Past A Circular Cylinder In A Plane Channel Dhanya Ros V.G 2007. (7) Evolving Genetic Algorithm Trained Neural Network For Dynamic Simulation Of Phenol Biodegradation In A Fluidized Bed Bioreactor M.Neelima, 2006. (5) Heat Transfer Enhancement in Plate-Fin Exchanger using Nanorefrigerants, Sponsored by Aeronautics Research & Development Board (ARDB), 2017, Rs. 31 lacs. (4) Co-investigator for Investigation of hydrodynamics of surface aeration of tanks and validation of CFD models using Radioactive Particle Tracking (RPT). Sponsored by Board of Research in Nuclear Sciences (BRNS), Rs. 25 lacs, 2014 (Principal Investigator: Dr. Ajey Kumar Patel, Dept of Civil Engineering). (3) MHRD project on Curriculum Design and Development for 'Fluid & Particle Mechanics" as a part of "Developing suitable pedagogical methods for various classes, intellectual calibers and research in e-learning" under National Mission project on education through ICT. Coordinated by IIT Kharagpur. 2009-2012. Grant: Rs. 8 lacs. (2) Institute research seed money project (RSM) On Heat Transfer Enhancement using Nanofluids Rs. 3.75 lacs. 2012. (1) Co-investigator for Modeling and Simulation of Fluidized Bed Bioreactors, Sponsored by Department of Biotechnology, Rs. 12.3 lacs, 1998- 2001 (Principal Investigator: Prof. G. Venkat Reddy). Testing of Oil sample. M/s Arc India Petroleum Pvt. Ltd., Secunderabad, Rs. 11,236/-. (34) Haritha Madhava Reddy, Venu Vinod A, CFD Simulation of Heat Transfer using Nanofluids in Microchannel with Dimple and Protrusion, ï»¿Indian Chemical Engineer 61, NO. 1, 40–51, 2019, DOI: 10.1080/00194506.2017.1418438. (33) B. Anil Kumar Naik, A. Venu Vinod, ANN Modelling of Viscosity and Effective Thermal Conductivity of Non-Newtonian Nanofluids, Journal of Testing and Evaluation, 47, No. 2, 791-808, 2019, doi:10.1520/JTE20170274. (32) Sujan Kumar Bashapaka and Venu Vinod Ananthula, Experimental and Modeling Studies on Mixing Behavior of Binary Mixtures in a Spout-Fluid Bed, Particulate Science and Technology, (2018). DOI: 10.1080/02726351.2017.1381657. (31) Anil Kumar Naik B; Venu Vinod Ananthula, Heat Transfer Enhancement using Non-Newtonian Nanofluids in a Shell and Helical Coil Heat Exchanger, Experimental Thermal and Fluid Science, 90, 132-142, 2018. (30) B. Anil Kumar Naik, A. Venu Vinod, " Rheological Behavior and Effective thermal conductivity of non- Newtonian nanofluids" Journal of Testing and Evaluation (ASTM), 46 (2), 445-456, 2018. (29) B.Sujan Kumar, A.Venu Vinod, Bed expansion ratio of mono-sized and binary mixtures in Fluidized, Spouted and Spout-fluid beds, Particulate Science and Technology, 36 (8), 1006-1016, 2018 DOI: 10.1080/02726351.2017.1338808. (28) A. Venu Vinod, Teaching Tips: Fluid and Particle Mechanics Crossword Puzzle, Chemical Engineering Education, Vol 51, No. 4, p. 186, 2017. (27) Neelima chowdary Kommareddy, Venu Vinod Ananthula, CFD Simulation of Algae Production in Airlift Photobioreactor, Journal of Hazardous, Toxic, and Radioactive Waste, 21 (4), 2017. (26) Naveen Kumar Rayi, Neelima Chowdary K, and Venu Vinod Ananthula, Gas Holdup in Bubble Column Bioreactor Degrading Phenol, Journal of Hazardous, Toxic, and Radioactive Waste, 21-2, 1-7, 2017, DOI: 10.1061/(ASCE)HZ.2153-5515.0000337. (25) B.Sujan Kumar, A.Venu Vinod, Mixing characteristics of binary mixtures in a Spout-Fluid Bed, Particulate Science and Technology, 35:2, 183-191, 2017, DOI: 10.1080/02726351.2016.1146810. (24) T. Srinivas, A. Venu Vinod, Heat Transfer Intensification in a Shell and Helical Coil Heat Exchanger using Water-based Nanofluids, Chemical Engineering and Processing: Process Intensification, 102, 1-8, 2016. (23) T.Srinivas, A. Venu Vinod, The Effective Thermal Conductivity of Water Based Nanofluids at Different Temperatures, Journal of Testing and Evaluation (ASTM), 44, Issue 1, 280-289, 2016. (22) T.Srinivas, A. Venu Vinod, Heat Transfer Enhancement using CuO/Water nanofluid in a shell and Helical Coil Heat Exchanger, Procedia Engineering 127 ( 2015 ) 1271 - 1277, International Conference on Computational Heat and Mass Transfer-2015, November 30-Dec 2, 2015, National Institute of Technology, Warangal, India. (21) Sujan Kumar Bashapaka & Venu Vinod Ananthula, Pressure Drop and Gas Holdup Studies in a Spout-Fluid Bed, Particulate Science and Technology, 33, Issue 1, January 2015, pages 91-96. (20) Naveen Kumar Rayi & Venu Vinod Ananthula, Biodegradation of phenolic wastewater in a bubble column bioreactor with internal draft tube, Indian Journal of Chemical Technology 21, January 2014, pp. 44-48. (19) Rayi Naveen Kumar and Ananthula Venu Vinod, Oxygen Mass Transfer in Bubble Column Bioreactor, Periodica Polytechnica - Chemical Engineering, 58, 1, 21-30, 2014. (17) Nadendla, Rajasekhar and Venu Vinod, A., Controllability of Distillation Sequences for the Separation of Ternary Mixture, Chemical Product and Process Modeling, Vol. 6: Iss. 1, Article 29, 2011. (16) A Venu Vinod, Sadasiva Rao P., Microfluidics of Nanodrug Delivery: Effect of Reynolds Number Ratio and Particle Size, Chemical Product and Process Modeling, Vol 6, Issue 1, Article 32, 2011. (15) Venu Vinod, B. Narender Reddy, Microfluidics of Nanodrug Delivery at Different Angles of Drug Injection, Chemical Product and Process Modeling, 5, Issue 1, Article 31, 2010. (14) Sravani Gowri Laxmi Y, A. Venu Vinod, CFD simulation of wall effects in flow past a square cylinder in a stationary and moving plane channel, Chemical Product and Process Modeling, 5, Issue 1, Article 23, 2010. (13) Venu Vinod, K. N. Ajeesh and G. Venkat Reddy, Studies on Gas Holdup in a Draft Tube Fluidized-Bed Bioreactor, Indian Chemical Engineer, 52, 128-137, 2010. (12) Venu Vinod A., K. Arun Kumar and G. Venkat Reddy, Simulation of Biodegradation Process in a Fluidized Bed Bioreactor using Genetic Algorithm Trained Feedforward Neural Network, Biochemical Engineering Journal, 46, 12-20, 2009. (11) Venu Vinod, A., Neelima, M., Venkat Reddy, G., Dynamic Simulation of Phenol Biodegradation in a Fluidized Bed Bioreactor using Genetic Algorithm Trained Neural Network, Chemical Product and Process Modeling, 3, Issue 1, Article 46, 1-19, 2008. (10) A.Venu Vinod and G.Venkat Reddy, Mass Transfer Correlation for Phenol Biodegradation in a Fluidized Bed Bioreactor, Journal of Hazardous Materials, B136, 727-734, 2006. (8) Venu Vinod, A., Dhanya Ros, CFD simulation of wall effects in flow past a circular cylinder in a plane channel, Institution of Engineers (I) Journal ï¿½?? CH, 89, 3-9, 2008. (7) A.Venu Vinod and G.Venkat Reddy, Stability and Dynamic Behavior of a Fluidized Bed Bioreactor Treating Phenolic Effluent, Indian Chemical Engineer, 51, 228-239, 2009. (6) A.Venu Vinod, K. Arun Kumar and G.Venkat Reddy, Evolving Genetic Algorithm Trained Feed-forward Neural Network for the Simulation of the Tubular Reactor with Axial Mixing (TRAM), Indian Chemical Engineer 50, 130-141, 2008. (5) A.Venu Vinod and G.Venkat Reddy, Modeling the Performance of Draft Tube Fluidized Bed Bioreactor Using Residence Time Distribution (RTD), Indian Chemical Engineer, 49, 29-37, 2007. (4) A.Venu Vinod and G.Venkat Reddy, Volumetric Oxygen Mass Transfer Coefficient in a Fluidized Bed Bioreactor Degrading Phenol, Indian Chemical Engineer 48, 230-239, 2006. (3) G. Venkat Reddy, A. Venu Vinod, Ch. Ravi Shankar, Mass Transfer Studies on Biodegradation of Phenolic Wastewater in Draft Tube fluidized bed bioreactor, Indian Chemical Engineer, 48, 81-87, 2006. (2) Venu Vinod, A., K. N. Ajeesh, G. Venkat Reddy, Studies on Gas Hold-up in a Draft Tube Fluidized-Bed Column, Indian Chemical Engineer, 46, 229- 233, 2004. (1) Venu Vinod, A, G.Venkat Reddy, Dynamic Behavior of a Fluidized Bed Bioreactor Treating Wastewater, Indian Chemical Engineer, 45, 20-27, 2003. (40) Ramakant Gadhewal, Venu Vinod A, Sunil Kumar Thamida, Simulation of Multiphysics in a PEM Fuel Cell, 2nd International Conference on New Frontiers in Chemical, Energy and Environmental Engineering (INCEEE-2019) -INDIA, February 15-16, 2019, National Institute of Technology, Warangal, India. ISBN: 978-81-928314-5-9. 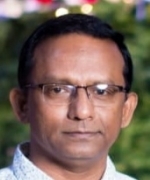 (39) Keerthi Sanghamitra. K, Yamini Ananthan, Y.L.V.D Prasad, A.O.Siddiqui, A.Venu Vinod, Neha Hebalkar, Thermographic Study of Aerogel Composites, 2nd International Conference on New Frontiers in Chemical, Energy and Environmental Engineering (INCEEE-2019) -INDIA, February 15-16, 2019, National Institute of Technology, Warangal, India. ISBN: 978-81-928314-5-9. (38) Harshal Patil, Ajey Kumar Patel, K. Devarajan, A. Venu Vinod, Comparison of Different off Bottom Impeller Clearances to Investigate the Effect on Hydrodynamics in Rushton Turbine Stirred Tank, 2nd International Conference on New Frontiers in Chemical, Energy and Environmental Engineering (INCEEE-2019) -INDIA, February 15-16, 2019, National Institute of Technology, Warangal, India. ISBN: 978-81-928314-5-9. (37) B. Anil Kumar Naik and A. Venu Vinod, Natural Convection Heat Transfer in a Shell and Helical Coil Heat Exchanger using Non-Newtonian Nanofluids, 2nd International Conference on New Frontiers in Chemical, Energy and Environmental Engineering (INCEEE-2019) -INDIA, February 15-16, 2019, National Institute of Technology, Warangal, India. ISBN: 978-81-928314-5-9. (36) Karshal Patil, Ajey Kumar Patel, Harish J Pant, A Venu Vinod, Effect of Fluid Motion on Radiation Intensity in RPT Technique , During calibration,: A case of stirred tank, International Conference on Advanced Applications of Radiations Technology (NICSTAR 2018) organised by National Association for Application of Radiaoisotopes and Radiation in Industry (NAARI) at Mumbai during March 5 -7, 2018. (35) B. Anil Kumar Naik, A. Venu Vinod, Thermal performance of shell-and-helical coil heat exchanger using non-Newtonian nanofluids, International Conference Numerical Heat Transfer and Fluid Flow, NIT Warangal, India ï¿½?? Jan 19-21, 2018. (34) B. Anil Kumar Naik and A.Venu Vinod, Stability, Rheological behavior and thermal conductivity of Fe2O3-CuO hybrid nanofluids, 70th Annual Session of Indian Institute of Chemical Engineers, CHEMCON 2017, 27-30 December 2017, Haldia Institute of Technology, India. (33) Harshal Patil, Ajey Kumar Patel, Harish. J. Pant, A. Venu Vinod, CFD Simulation Model for Mixing tank Using Multiple Reference Frame (MRF) Impeller Rotation , 22nd International Conference on Hydraulocs, Water Resources & Coastal Engineering, HYDRO-2017 held at LD College of Engineering, Ahmedabad during December 21-23, 2017. (32) B. Anil Kumar Naik, A. Venu Vinod, Rheological behaviour and Thermal conductivity of Al2O3 ï¿½?? CuO in CMC based hybrid nanofluid, 69th Annual Session of Indian Institute of Chemical Engineers, CHEMCON 2016, 27-30 December 2016, Anna University, Chennai, India. (31) G. Singh, A.K.Patel, H.S. Patil, A. Venu Vinod, H.J.Pant, Comparison of Different Turbulent Models to Simulate Flows in Fully Baffled Stirred Tank, 68th Annual Session of Indian Institute of Chemical Engineers, CHEMCON 2015, 27-30 December 2015, Indian Institute of Technology Guwahati, India. (30) T.Srinivas, A. Venu Vinod, Forced Convection Heat Transfer Enhancement using TiO2 / Water Nanofluid in a shell and Helical Coil Heat Exchanger, 68th Annual Session of Indian Institute of Chemical Engineers, CHEMCON 2015, 27-30 December 2015, Indian Institute of Technology Guwahati, India. (28) Rahul Kunnath, K. Neelima Chowdary, A. Venu Vinod, CFD Simulation of Heat Transfer using nanofluids in microchannel having dimples and protrusions, International Conference on Advances in Chemical Engineering (ICACE 2015), 20-22 December 2015, National Institute of Technology, Surathkal, India. (27) G. Bhuvaneswari, M. Haritha, A. Venu Vinod, CFD Studies on pressure drop for low Reynolds Number fluid flows across orifice in a similarly shaped microchannel, International Conference on Advances in Chemical Engineering (ICACE 2015), 20-22 December 2015, National Institute of Technology, Surathkal, India. (26) T.Srinivas, A. Venu Vinod, Heat Transfer Enhancement using CuO/Water nanofluid in a shell and Helical Coil Heat Exchanger, International Conference on Computational Heat and Mass Transfer, November 30-Dec 2, 2015, National Institute of Technology, Warangal, India. (25) B. Sujan Kumar, A. Venu Vinod, Gas Holdup studies in a Spout Fluid Bed, International Conference on New Frontiers in Chemical, Energy and Environmental Engineering (INCEE) -INDIA, March 20-21, 2015, National Institute of Technology, Warangal, India. (24) T.Srinivas, A. Venu Vinod, Performance analysis of a helical coil heat exchanger using CuO/water nanofluid, International Conference on New Frontiers in Chemical, Energy and Environmental Engineering (INCEE) -INDIA, March 20-21, 2015, National Institute of Technology, Warangal, India. (23) Meenakshi, Rahul Kunnath, A. VenuVinod, Amol Raykar, CFD simulation for Heat Transfer In Double Pipe Helical Heat Exchanger Using Nanofluid, Indian Chemical Engineering Congress-2014, CHEMCON-2014, 27-30 December 2014, Panjab University, Chandigarh. India. (22) B. Sujan Kumar, A. Venu Vinod, Pressure drop studies in a Spout-Fluid Bed, Indian Chemical Engineering Congress-2014, CHEMCON-2014, 27-30 December, 2014, Panjab University, Chandigarh, India. (21) T. Srinivas, A. Venu Vinod, Forced convection heat transfer enhancement in helical coil heat exchanger using CuO/water nanofluid, Indian Chemical Engineering Congress-2014, CHEMCON-2014, 27-30 December, 2014, Panjab University, Chandigarh, India. (20) T.Srinivas, A. Venu Vinod, "Heat Transfer Studies in a Agitated Shell & Helical Coil Heat Exchanger using using CuO-Water nanofluid", 3rd International Conference Nanocon 014 - Smart Materials, Composites, Applications and New Inventions organized by Bharati Vidyapeeth University in Association with North Carolina A & T state University, Greensboro, USA (NCAT), Tuskegee University, Alabama, USA (TU), The University of Tokushima, Japan and Centre for Materials for Electronics Technology (C-MET) Department of Information Technology, Government of India, Pune on 14, 15 October, 2014. (19) B. Sujan Kumar, A. Venu Vinod, Pressure drop and Gas holdup studies in a Spout-Fluid Bed, International Conference on Powder, Granule and Bulk Solids: Innovations and Applications, Thapar University, Patiala, India, November 28 to 30, 2013. (18) B. Sujan Kumar, A. Venu Vinod, Mixing of Binary Mixture in a Spout-Fluid Bed, International Conference on Chemical and Bioprocess Engineering-INDIA, November 16-17, 2013, National Institute of Technology, Warangal, India. (17) T.Srinivas, A. Venu Vinod,Natural convection heat transfer enhancement in shell and coil heat exchanger using CuO/water nanofluid. International Conference on Chemical and Bioprocess Engineering-INDIA, November 16-17, 2013, National Institute of Technology, Warangal, India. (16) T.Srinivas, A. Venu Vinod,Heat Transfer Enhancement in Helical Coil Heat Exchanger using Al2O3/Water nanofluid, Indian Chemical Engineering Congress, CHEMCON-2013, ICT, Mumbai, December 27-30, 2013. (15) T. Srinivas, A.Venu Vinod, Heat Transfer Enhancement in Heat Exchangers using Nanofluids: A Review, Indian Chemical Engineering Congress, CHEMCON-2012, Jalandhar, December 27-30, 2012. (14) R. Naveen Kumar, A.Venu Vinod, Dynamic Behavior of a Bubble Column Bioreactor Degrading phenol, Indian Chemical Engineering Congress, CHEMCON-2012, Jalandhar, December 27-30, 2012. (13) R. Naveen Kumar, A.Venu Vinod, Gas Holdup in a Bubble Column Bioreactor Degrading Phenol, Indian Chemical Engineering Congress, CHEMCON-2011, Bangalore, December 27-29, 2011. (12) A. Venu Vinod, R. Naveen Kumar, Dynamic and Gas Holdup Studies in a Bubble Coulm Bioreactor, 2011 2nd International Conference on Environmental Science and Technology (ICEST 2011) Singapore (IEEE) ISBN: 978-1-4244-9262-6, Vol. 2, 384-387, February 26-28, 2011. (11) A. Venu Vinod, R. Naveen Kumar, Biodegradation of Phenolic wastewater in a Bubble Column Bioreactor, Asian Congress on Biotechnology (ACB 2011), Shanghai, China, May 11-15, 2011. (10) R Naveen Kumar, A. Venu Vinod, Experimental Studies on Biodegradation of Phenolic Wastewater in a Bubble Column Bioreactor, Indian Chemical Engineering Congress-2010, CHEMCON-2010, Annamalai Nagar, December 27-29, 2010. (9) Venu Vinod, A, G.Venkat Reddy Simulation of Biodegradation of Synthetic Wastewater at Higher Concentrations in a Fluidized-Bed Bioreactor with an Internal Draft tube 18th International Conference on Chemical Reaction Engineering (ISCRE 18) Chicago, Illinois, USA June 6 - 9, 2004. (8) Venu Vinod, A, G.Venkat Reddy RTD Studies in a Fluidized-bed Bioreactor Treating Phenolic Wastewater Indian Chemical Engineering Congress, CHEMCON-2002, Hyderabad, December 19-22, 2002. (7) Venkat Reddy, G., Rajeswari, G., A. Venu Vinod Studies On Mass Transfer Coefficient In a Fluidized Bed Bioreactor Indian Chemical Engineering Congress, CHEMCON-2002, Hyderabad, December 19-22, 2002. (6) Venkat Reddy, G., A.Venu Vinod Dynamic Behavior Of Biodegradation of Phenolic Wastewater in Draft Tube Fluidized Bed Bioreactor 17th International Symposium on Chemical Reaction Engineering (ISCRE 17) Honk Kong, August 25 - 28, 2002. (5) Venu Vinod, A., K. N. Ajeesh, G. Venkat Reddy Studies on Gas Holdup in a Fluidized-Bed Column with an Internal Draft Tube Indian Chemical Engineering Congress, CHEMCON-2003, Bhubaneswar, December 19-22, 2003. (4) Venkat Reddy, G., A.Venu Vinod Dynamic Behavior of a Draft Tube Fluidized Bed Bioreactor Treating Phenolic Wastewater Indian Chemical Engineering Congress, CHEMCON-2001, Chennai, December 19-22, 2001. (3) Venkat Reddy, G., A.Venu Vinod Dynamic Behavior of a Draft Tube Fluidized Bed Bioreactor Treating Synthetic Wastewater Indian Chemical Engineering Congress, CHEMCON-2001, Chennai, December 19-22, 2001. (2) Venkat Reddy, G., A. Venu Vinod Biodegradation of phenolic wastewater in a fluidized bed bioreactor Indian Chemical Engineering Congress, CHEMCON-2000, Culcutta, December 18-21, 2000. (1) Venu Vinod, A., Anil Kumar Nonaqueous Dispersion Polymerization of Methyl Methacrylate Indian Chemical Engineering Congress, CHEMCON-2000, Culcutta, December 18-21, 2000. 4. Rahul Kunnath, K. Neelima chowdary and A. Venu Vinod, CFD Simulation of Heat Transfer Using Nanofluids in Microchannel Having Dimples and Protrusions, Recent Advances in Chemical Engineering, Springer Science +Business Media Singapore 2016, DOI 10.1007/978-981-10-1633-2_36. pp: 327-335. 3. G. Bhuvaneswari, Haritha Madhava Reddy and Venu Vinod Ananthula, CFD Studies on Pressure Drop for Low Reynolds Fluid Flows Across Oriï¿½ï¿½?ce in Similarly Shaped Microchannel, , Recent Advances in Chemical Engineering, Springer Science +Business Media Singapore 2016, DOI 10.1007/978-981-10-1633-2_39. 355-360. 2. T. Srinivas and A. Venu Vinod, Natural Convection Heat Transfer Enhancement in Shell and Coil Heat Exchanger using CuO/Water Nanofluid, Chemical and Bioprocess Engineering: Trends and Developments, CRS Press, Taylor & Francis Group, Chapter No. 23. ISBN: 9781771880770, 2015. 1. B. Sujan Kumar and A. Venu Vinod, Mixing of Binary Mixture in a Spout-Fluid Bed, Chemical and Bioprocess Engineering: Trends and Developments, CRS Press, Taylor & Francis Group, Chapter No. 25. ISBN: 9781771880770, 2015. Invited by McGraw-Hill to review Mass Transfer Operations by R.E.Treybal (2006). The paper entitled RTD Studies in a Fluidized-bed Bioreactor Treating Phenolic Wastewater authored by A.Venu Vinod and G.Venkat Reddy, and presented by A.Venu Vinod has won appreciation as the Best Presentation in the Technical session Environmental Engineering at CHEMCON 2002 at Hyderabad during December 19-22, 2002. Received the second best prize for the paper Dynamic Behavior of a Draft Tube Fluidized Bed Bioreactor Treating Phenolic Wastewater, by G.Venkat Reddy and A.Venu Vinod, in Environmental Engineering session at Indian Chemical Engineering Congress (CHEMCON-2001) held at Central Leather Research Institute, Chennai during December 2001. Coordinator, 2nd International Conference on New Frontiers in Chemical, Energy and Environmental Engineering (INCEEE-2019) -INDIA, February 15-16, 2019, National Institute of Technology, Warangal, India. Expert Member of Selection Committee for Teaching Assistant at NIT Surat. Coordinator, Workshop on Free and Open Source Software in Teaching and Learning during March 4 - 5, 2017 organized by Teaching Learning Centre, NIT W.
Secretary, Students' Cooperative Stores NIT Warangal, October 2016 - April 2018. Associate Dean (Admissions) NITW, November 24, 2014 - November 2016. Convener, International Conference on New Frontiers in Chemical, Energy and Environmental Engineering (INCEE) -INDIA, March 20-21, 2015, National Institute of Technology, Warangal, India, organized on the occasion of the Golden Jubilee of the Department of Chemical Engineering., NIT Warangal. Coordinator, Golden Jubilee Alumni Meet: Department of Chemical Engineering, January 30-31, 2015. Head, Department of Chemical Engineering, December 2013 - November 2014. Visited Department of Chemical Engineering, Michigan Technological University USA during May 2014. Head, Department of Chemical Engineering, February 26, 2009 - July 1, 2011. Head, Department of Biotechnology, July 2, 2011 - December 1, 2011, July 16, 2012 January 16, 2013. Faculty In-Charge, Alumni Affairs NITW, August 2008 - April 2011. In-charge, Fluid & Particle Mechanics Laboratory, 1997-2014. Previously: Member, AICTE Expert Committee; Warden; Departmental Coordinator, Training & Placement Section; Treasurer, Chemical Engineering Association; Member, Library Advisory Committee; Member, Institute Web Committee; Member, Undergraduate Admissions Committee; In-charge, Heat Transfer Laboratory; Staff Advisor - Chemical Engineering Association; Staff Coordinator - IIChE Student chapter NITW. Reviewer: Chemical Product and Process Modeling, Journal of Hazarduous Materials, Bioresource Technology, Biochemical Engineering Journal, Applied Thermal Engineering, Particulate Science & Technology, Chemical Engineering & Processing: Process Intensification, Current Nano Science. Reviewed PhD thesis for Andhra University, Dr. Babasaheb Ambedkar Technological University (2013). Reviewed M.S thesis for Anna University, Chennai (2014). Reviewed PhD thesis for Satyabhama University, Chennai (2014). Reviewed M.Tech (Research) thesis for NIT Rourkela (2014). Reviewed PhD thesis for Academy of Scientific & Innovative Research (AcSIR), Government of India (Indian Institute of Petroleum), (2015). Reviewed PhD thesis for Curtin University, Malasiya (2017).